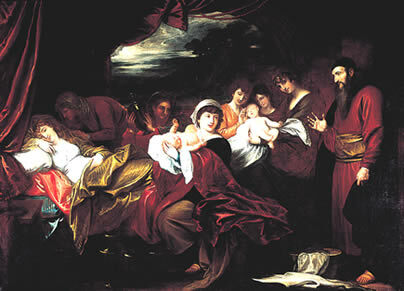 Esau is the eldest son of Isaac and Rebekah in the Book of Genesis. Jacob is his twin brother. (Chapter 25). He is a 'cunning hunter, a man of the field' (25:27) Esau gives his birthright as eldest to Jacob for a meal of lentil stew. He is then tricked out of his father's blessing by Rebekah and Jacob. He has several wives, Judith the daughter of Beeri the Hittite, and Bashemath daughter of Elon. He later marries Mahalath the daughter of Ishmael, his cousin, to please his parents. Esau Facts for Kids. Kiddle Encyclopedia.